Ferrovial-Lagan were appointed as JV partners to deliver the prestigious M8, M73, M74 Improvement Project as Principal Contractors under the Construction [Design and Management] Regulations 2007 on behalf of Transport Scotland. The £500M major public sector transport infrastructure scheme involved construction of a new motorway between Baillieston and Newhouse completing the M8 between Glasgow and Edinburgh as well as upgrading the existing M8 between Easterhouse and Baillieston and existing M73 between Baillieston and Maryville as well as the M74 between Daldowie and Hamilton. The scheme involved on and off-line construction of 12km of new motorway, some 30km of motorway widening and 16km of network upgrades with significant impact on road users and local communities and which incorporated the re-design of one of Scotland’s busiest junctions at Raith Interchange which included the construction of 3 no. bridges and underpass on the A725 as well as a number of other significant highway structures over the length of the project. The scheme has improved connectivity between Glasgow and Edinburgh and to the south reducing congestion and journey times while improving road safety and helping to promote Scotland’s sustainable economic growth. 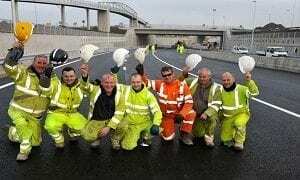 As a trusted partner of the Lagan Construction Group and as approved providers on the company’s preferred suppliers list Venesky-Brown were approached to supply high quality, skilled, and experienced local civil engineering operatives to meet the clients local labour community benefit requirements.